More and more people are choosing the bicycle to get from A to B, stay fit, healthy, active, socialise and meet people or save money on travel. Cycling is the perfect mode of transport for short distances and can often be quicker than walking, take the hassle out of finding a spot to park and, being non-weight bearing cardio vascular exercise, cycling is good for your heart, lungs and joints too. The health benefits are many and varied. A study of adults in Denmark showed commuter and recreational cycling was consistently associated with lower risk of Type 2 Diabetes. The study also found that those who started cycling regularly later in life or continued cycling when they reached retirement also lowered the risk of Type 2 Diabetes by 20%. Electric bikes, or e-bikes, have also seen an increase in popularity as we shift from traditional modes of transport to more environmentally friendly ones. E-bikes allow cycling to become a real possibility for many who would not otherwise have chosen to travel by bike. Cycling Scotland, the University of Dundee Institute of Sport and Exercise, Tactran and Electric Bikes Scotland, have joined forces to develop an innovative programme to introduce those reaching retirement age to confidence building cycle training. 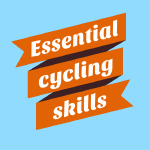 Using Cycling Scotland’s tried and tested Essential Cycling Skills course, taking part will help you become more familiar with local cycle routes too. If you and keen to build your skills and confidence on a bike or simply want to cycle in your local town, village or city, Essential Cycling Skills will be running across Angus, Dundee, Stirling and Perth & Kinross from November 2017 to November 2018.